Hey everybody! I'm so excited to share with you some wonderful news! My dear friend Stacy and I have been developing a plan for new scrapbooking business for nearly a year. Honestly though, we did more talking than actual action the first six months. Fortunately though, we really got the ball rolling several months back and it is now at a point that I can begin to share the information with everyone. We have officially launched Scrapper's Rx (read as Scrapper's Prescription) Scrapbooking Retreats. Our first two scheduled retreats will be held June 19-22 and September 18-22 at the beautiful Courtyard by Marriott in Cocoa Beach, Florida. First, let me tell you a little about the hotel. As soon as Stacy and I checked it out, we knew that this was the place! As we drove in, I was taken with the old scrub oaks overhanging the parking area and for a little bit, I almost forget I was on the beach...at least until I got out of the car and I smelled the pleasing salt air. When we walked into the hotel, we were impressed with the modern and clean decor, as well as a large touch-screen display (Lobby GoBoard) that provided information about the weather, local sites, and so much more. The staff was beyond helpful and continues to be incredibly accommodating. (This really has built our confidence that this is definitely the right place to host our first events.) The meeting area is spacious and easily expanded to accommodate lots of scrappers and even a classroom. 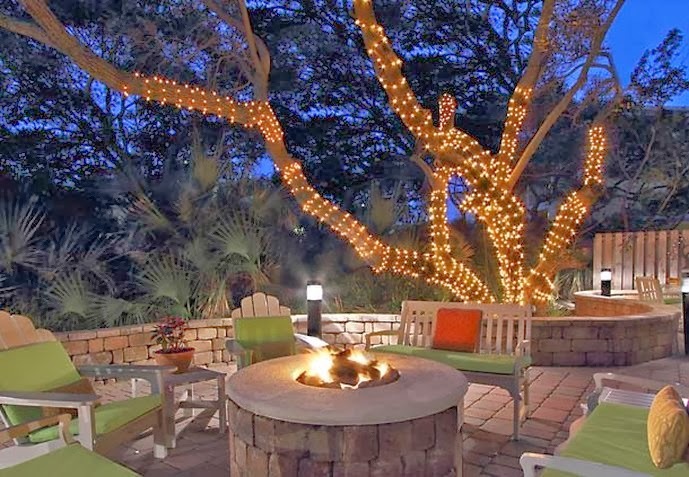 The hotel has a pool, restaurant and a oak-covered patio with a fire pit. I told Stacy, if I go missing in action, just go to the patio, that's where I would be. :) And how can I forget, there is a Starbucks in the hotel!!! Another plus with this hotel is that it is on the beach side of A1A, so there is no worry about crossing the busy road way. The hotel isn't directly on the beach, but it does have a short, well kept, walkway to the beach. There is just so much I could tell you about this place. I just love it and can't wait to spend the weekend there! Next, I need to tell you about the sleeping accommodations. We were able to do something very interesting. Right next door, literally a few yards away is their sister hotel, the Hampton Inn. This is where you will sleep. It may seem odd to have the event in the Courtyard by Marriott, and sleep in a different hotel, but they are owned by the same company and by doing this we were able provide a better priced package and also offer breakfast. We wanted to have retreat on the beach, but price is often a deterrent, but this option really helped to make hosting a beach retreat a reality. 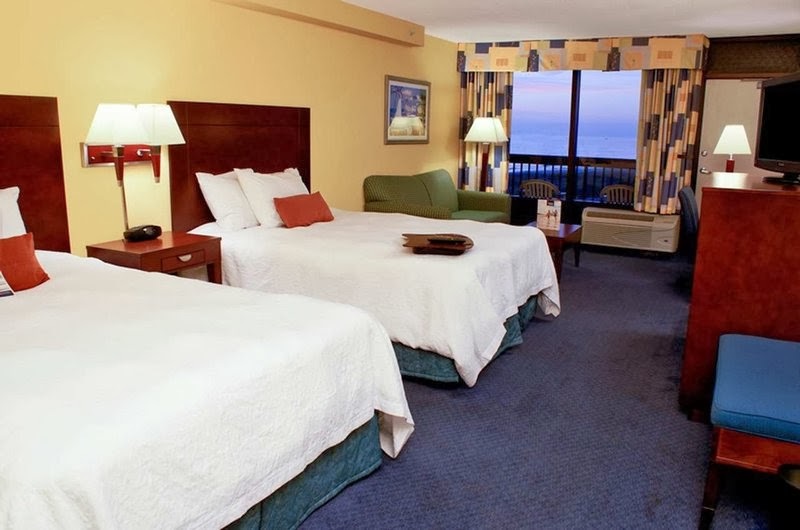 Here's a pic from the Hampton Inn website that shows you one of the Ocean View rooms. Look at that view! We have a website that contains all the information about the accommodations, retreat details, inclusions and prices. It's called, what else? Scrapper's Rx Stacy and I have worked on providing the best experience possible. It depends on your package, how many meals you get, but if you were to stay over night for the full weekend, you would receive breakfast, lunch and dinner both Friday and Saturday and only breakfast on Sunday. Every scrapper will have a six foot wide space...no extra charges there. Every table will have power, also at no charge. Everyone will also receive a welcome gift from us. There will be door prizes all weekend...and not stuff that is five years old...I hate when that happens. It will be current stuff and stuff that both traditional AND digital scrappers would want. There will be classes, demos and vendors, too. We'll also provide snacks, a Cricut and Silhouette station, and much, much more. I promise, you will want to be there! It only takes a $75 deposit to hold a spot and attendees can pay a little over time to help make the cost easier. We can currently take Paypal payments and checks. Just go to our Recovery Programs page to view the different packages and prices. If all goes as well at the retreat as it has so far, we plan to host retreats at least twice a year at this location. We also plan to expand to other locations in the southeast United States, so be sure to go to our Facebook page and "Like" us, so you will receive notices of new events. If you don't have a Facebook account, no worries. I will still continue to post here. I'm also very close to having a couple of more options set up to help you stay up-to-date on our events, like an email sign-up option on our website to help those that are interested receive emails about our latest events. So be on the lookout for that information on our website. Stacy and I sure do hope we see you there. Feel free to contact me, should you have any questions.